Add rhinestones and, add SPARKLE to your holiday art, crafts and design projects, such as scrapbook decoration, accessories & clothing accents, or production and costume design. 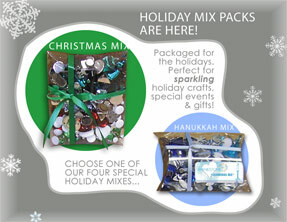 Our Holiday Mix Packs make a brilliant gift or goody bag for any special occasion. In November & December, receive a 10% discount when you order any item.